Director – Joseph Velasco, Producer – Tsung-lung Chang. Production Company – Filmline Enterprises/Spectacular Films. Following the death of actor Bruce Lee, Professor Lucas is brought in by the Secret Bureau of Intelligence and given orders to make three clones of him. Variously named Bruce Lee One, Two and Three, the clones are trained in secrecy. Unknown to his masters, Lucas also secretly instils the clones with conditioning that make them loyal to him. The Bruces are then despatched into the field to use their skills to eliminate drug dealers. Bruce Lee singlehandedly popularised the kung fu genre. Lee had made acting appearance in Hong Kong films in the 1950s but gained a name with a supporting role in the US-made tv series The Green Hornet (1967). He was then offered a series of films made in Hong Kong that highlighted his martial arts skills. Lee made only three starring films in Hong Kong before he was hired by Warner Brothers for the English-language Enter the Dragon (1973). However, Lee died three days before it was released and the tragedy added to the film’s success. Enter the Dragon created a fad for kung fu and filmmakers in both Hong Kong and the West mined the vein for several years afterwards. Uncompleted Bruce Lee projects such as Game of Death (1978) were finished using doubles, episodes of The Green Hornet were theatrically reissued highlighting Lee’s role, while other films used recycled footage, claimed to be sequels or featured spurious plots involving his brother investigating his death and the like. 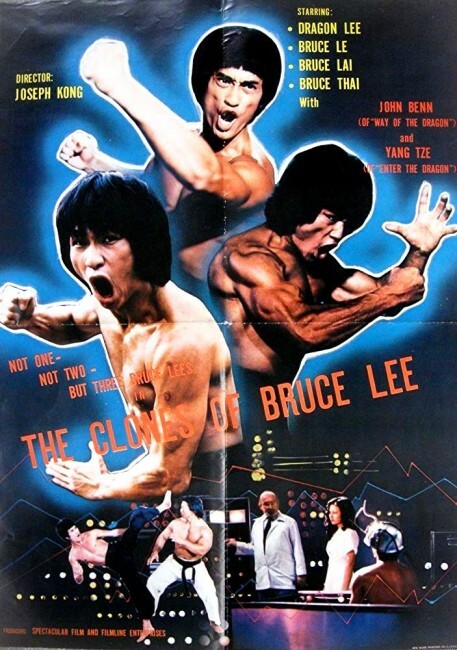 Then there was the entire Brucespoiltation phenomenon featuring other martial artists who took names such as Bruce Lai, Bruce Le, Bruce Lei, Bruce Li, Bruce Lie, Bruce Ly, Bruce Thai, Myron Bruce Lee, Bronson Lee and Dragon Lee who all played Bruce lookalikes in similar plots. Some of these become utterly demented such as The Dragon Lives Again (1977) where Bruce fights various nemeses in Hell and Bruce Lee Fights Back from the Grave (1976) in which Bruce is resurrected to fight on, even No Retreat, No Surrender (1986) where a downtrodden young American kid receives advice from Bruce’s ghost. The Clones of Bruce Lee is one of the more bizarre efforts amid the Brucespolitation fad. It has been conceived as a vehicle somewhat akin to The Expendables (2010) in bringing some of the most popular Bruce imitators – Bruce Le, Bruce Lai and Dragon Lee as the Bruces, along with Bruce Thai in a minor role as a field agent – all together under one roof. Despite the fact that all three are meant to be clones of Bruce, they look quite dissimilar when seen together. Certainly, they get the Bruce Lee hairstyle, costuming and a fairly good mimicry of his martial moves down such that you have no difficulty suspending you disbelief. In terms of a science-fiction film, The Clones of Bruce Lee is disappointing. The cloning aspect is over and done with in the opening scenes. (This is the magic cloning process we frequently get in ill-informed science-fiction films that allows a clone to come out as a fully-formed copy the same age and with even the same haircut as the donor). There is a plot development toward the end where Jon Benn, the Westerner who created the process, is revealed to be a mad scientist who has instilled the Bruces with mind control commands (something they quickly rebel against) and creates an army of supposedly invincible metal men (which consist of actors with bronze greasepaint on their skin). There is no real plot to the film – there is the basic set-up of a secret agency that orders the Bruces cloned and sends them into action to beat up/kill various evildoers and nothing more than that. Indeed, you would have to say there is almost nothing else to the film beyond a series of martial arts combat scenes that come one after the other. Certainly, you can commend the film and the various actors playing the Bruces as they prove energetic and lithe once they start throwing their fists and feet around. On the other hand, when this is all that the film has to offer, the result quickly becomes repetitive. The most bizarre scenes of the film are the ones where the Bruces discover that a certain poison grass holds the power to defeat the metal men. We then get a series of scenes where they head into combat wielding handfuls of grass and shove these into the mouths of their opponents, whereupon the metal men have to stop fighting, stagger away and munch on the grass, before falling dead.